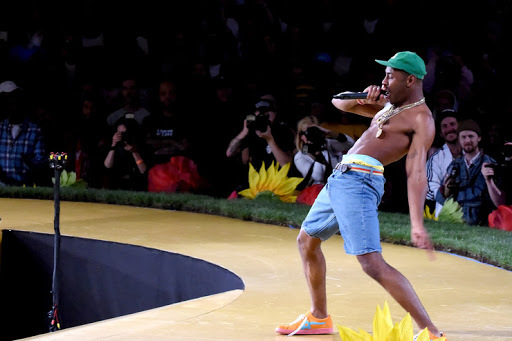 Home entertainment Tyler The Creator Shares Clip Of Kanye West Recording Verse For "SMUCKERS"
Tyler The Creator Shares Clip Of Kanye West Recording Verse For "SMUCKERS"
Tyler The Creator is quite honestly one of the most interesting and innovative artists of our time. In 2016 the multi-hyphenate consistently dolled out content all while managing his own clothing brand, producing a sketch comedy show, making music and whatever else he just so happened to be doing at that specific point in time. Though the artist played the first 10 minutes of the documentary at his Camp Flog Gnaw Carnival November last year, footage from the film has been kept tightly under wraps until today. The minute long clip also features footage from a portion of an interview with Lil Wayne. The full version of the film is slated for a DVD release this month. Check out the clip below and be on the look out for the documentary.